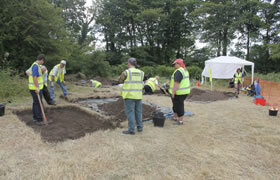 In conjunction with Kilwinning Heritage and with the consent of North Ayrshire Council, we developed an archaeology project for Ayrwaves 2012 – an International Guide Camp held in Eglinton Country Park. This project which was over three days on-site, introduced over 140 brownies, guides, senior section and leaders to the discipline through the investigation of Lady Jane's Cottage. 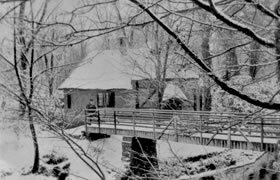 This early 19th century building was an ornamental cottage within the designed landscape of Eglinton Castle and used by Lady Jane Montgomerie as a retreat and for the education of local girls. Demolished in the 20th century the site of the cottage is now open grassland. In July 2012 our excavation trenches revealed the lower courses of walls, surrounding pathways and flagged surfaces of the cottage. 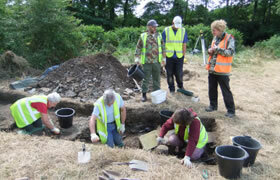 We were able to use archaeology to engage the visiting guides from around the world, enabling them to appreciate the historical importance of their camp site, Eglinton Castle. We also enabled them to contribute to improving our understanding of this important historical landscape. This project which was over three days on-site, introduced over 140 brownies, guides, senior section and leaders to the discipline through the investigation of Lady Jane's Cottage.